The trail starts in Lady Grey and the first 65km of the route is the same for both races, after the compulsory stop and medical check at Balloch are the Skyrunners allowed to continue while the Lite runners have completed their journey. The route climbs sharply out of Lady Grey to the first check point at the Tower; this is about a 12km run and is a combination of hiking trails and mountain running. As you climb the trail to the tower the majestic landscape unfolds in front of you and it now feels as if you are on top of Africa. Following the fence line you make your way along the ridge line to the second check point which is at Olympus, this is another 10km and the terrain is now devoid of paths and trails and athletes must decide which is the best route to the check point. After Olympus the athletes can pick up a small trail that will lead them to Snowden which is check point 3 another 11km or so, there is a natural spring just past Snowden where you can fill up your water bladders (does depend on how much rain has fallen so not always guaranteed a lot of water) before making your way to Avoca Peak the highest point (2756m) on the race. The climb up Avoca peak is challenging as the gradient is steep and the terrain is rough especially after good summer rain. From Avoca the route takes you over the “Dragonback” a ridge line that is about 3 meters wide with steep descends on either side, a fantastic formation of rock that is a feature of the race and a spectacular viewing point on a clear day. The route flattens out for a while as you move towards CP6 at Skidor which is again a leg of about 10km. At Skidor you descend into the valley down a technical descend before picking up the river that will lead you to the compulsory stop at Balloch Cave having now covered about 65km of the race. On paper, today’s stage of the Everest Trail Race was mostly downhill with 3183m of descent in comparison to 2105m of ascent over the 29.5km course. Don’t be fooled though, it was a tough day. 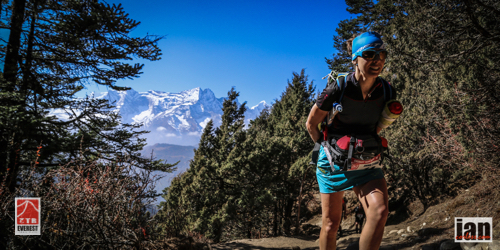 The terrain is relentlessly tough and technical and the altitude burns the lungs. Leaving Tengboche the race retraces stage-5 to Phakding and then branches left up to the race finish in Lukla. It’s a course with stunning views and vistas and Namche Bazar is impressive when looked upon with a bird’s eye view. Surrounded by beautiful white peaks it would be easy to be tempted to stop and just look in wonder at the awesome arena the Himalayas create. Behind the runners, Everest, Lohtse and Ama Dablam slowly but surely disappear from view with every step to Lukla, a sure sign that the 2014 ETR is drawing to a conclusion. 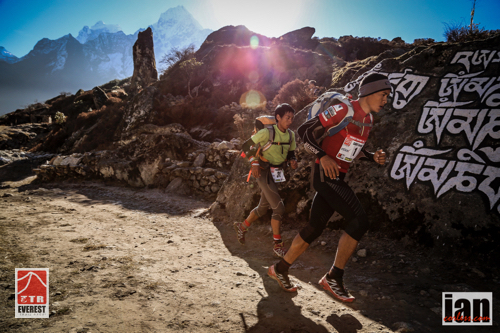 Samir Temang and Phudorje Lama Sherpa really put the pressure on early in the stage reaching Khumjung in just 45-mins. From here they pushed on together through Namche Bazar, Monjo, Phakding, Cheplung and they crossed the line together in just 3-hours 20-minutes. 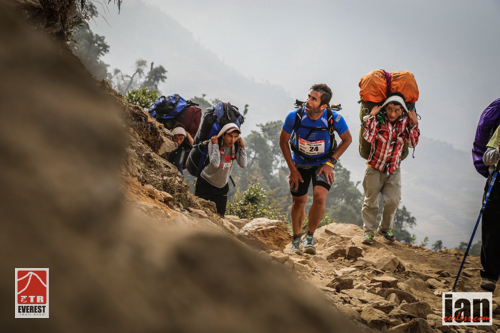 A crazy time for the course and one that confirmed Samir as the 2014 Everest Trail Race champion. Zigor Iturrieta found his legs again today and finished 3rd on the stage and 3rd overall. James Eacott placed 4th overall in the men’s race and he said that the ETR was one race that he would definitely come back to do again. Samir Temsang and Anna Comet are crowned the 2014 ETR champions but all credit goes to each and every finisher. 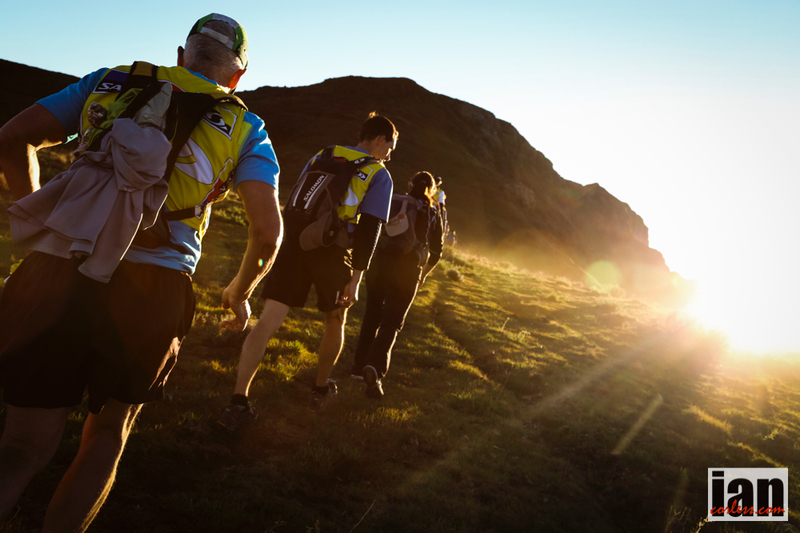 At 100-miles, this race may not be the longest but it is surely one of the toughest! The combination of tough technical terrain, relentless climbing and descending and of course altitude, all combine to make the ETR a race to do! 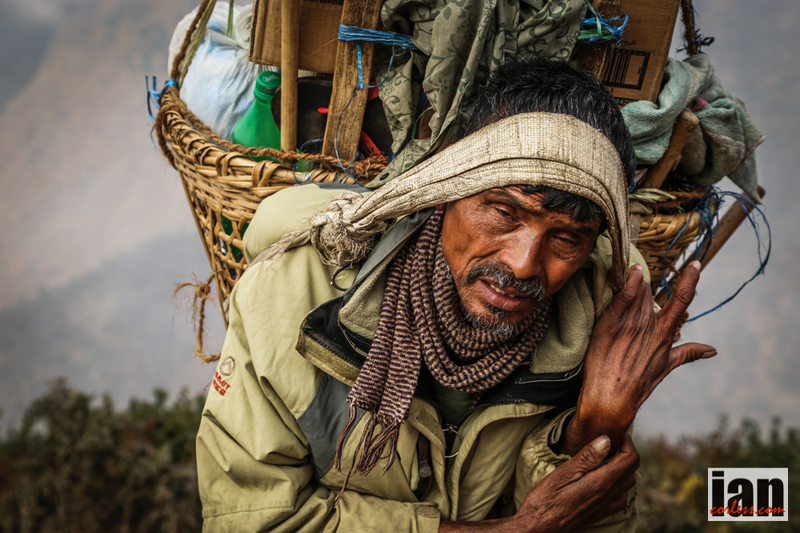 Many say that the 16km route from Phakding to Tengboche is one of the most beautiful trails in the world. The view of the Himalayan peaks is beyond mind blowing. Especially when you arrive at the summit an Everest, Lohtse and Ama Dablam await. It’s quite the picture postcard. Samir Temsang and Phudorje Lama Sherpa once again ran like demons and ran the course in a super impressive 2:51. Samir once again pipped Phudorje for the tape and a couple of seconds. James Eacott from the UK ran a great race and looked really strong to place 3rd on the stage from Zigor Iturrieta who struggled in the closing kilometres. Anna Comet made a clean sweep of 5-stages and 5-wins and Kerry Sutton despite a sprained ankle once again placed 2nd to secure her overall 2nd lady ranking. Yangdi Lama Sherpa repeated her consistent 3rd-place for every stage. The finish line at Tengboche is arguably one of THE most amazing finishing lines of any race and this was reflected in some of the emotions shown as runners crossed the line today. However, a tough 30km from Tengboche back to Lukla awaits each and every runner on day-6 of the Everest Trail Race. 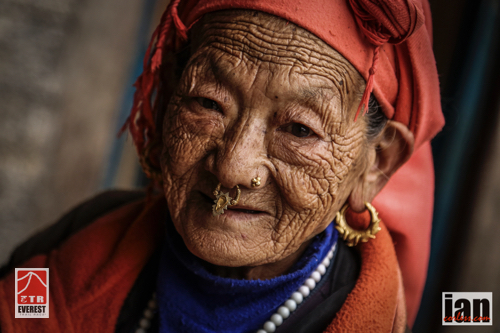 I’m pretty sure a few cold beers may well be enjoyed in Lukla tomorrow evening… believe me; they have been earned! The ETR may well ‘only’ be 100-miles but they are some of the toughest and most challenging miles available. The ETR is without doubt a bucket list race. Kharikola to Phakding is one of my favourite days on the ETR trails. It’s very much a transition stage. The first 3-days have been quiet with the occasional glimpse of life but now we are on the M6 motorway of Nepal. Porters are the HGV’s transporting all manner of goods from food and drink to 8’x4’ sheets of wood… yes, 8’x4’ sheets of wood. In and amongst this frenetic relay of goods the mule and yak trains add to the confusion and like all motorways there is a plethora of tourists moving up and down the trails. It’s a magic section of trail and one that I love. The diversity is incredible. Children at play, parents at work and the faces… don’t get me started on the faces! Life is people. The 2013 edition of the ETR presented wonderful vistas and blue skies, however, the Himalayas decided to hide behind low cloud today. An occasional glimpse of a peak way off into the distance offered a glimpse of what might. But the clouds were selfish. Leaving the sleepy monastery of Kharikola, 31km’s awaited the runners and after a short and twisting technical descent, a vertical kilometre of elevation to CP1 (Kari La) provided a great way to start the day and brush off the cobwebs. The descent to Surke (Cp2) is a 17km ankle twisting and knee swelling series of switchbacks of technical trail. But there is no rest, more climbing, more technical trails and finally the wire bridge at Monjo offers the ETR finish line. In total, 2996m of positive gain are balanced by 2335m of vertical descent. It may come as no surprise that Samir Temsang and Phudorje Lama Sherpa dictated the pace from the start and arrived at Cp1 in 1-hour. It was a ridiculous time considering the technicality and elevation of the course. Zigor Iturrieta was holding his ground but the writing was already on the wall. 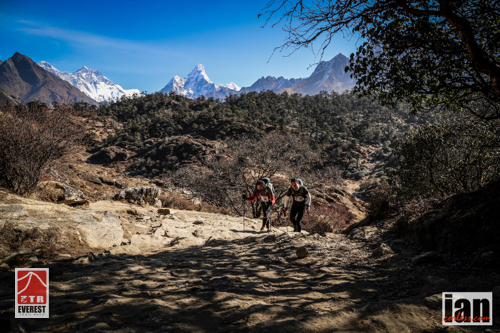 The Nepalese runners really do make running look easy here… arguably Zigor is the first human in the race! After Phudorje’s fall yesterday, Samir consolidated his overall lead and the two ran together to the line finishing just 3-seconds apart. Anna Comet is one seriously impressive lady! She has a look of focus and determination that is softened by a smile whenever she sees you. But don’t be fooled, it’s not weakness… it’s actually a smile of confidence. Hands-on-knees Anna powers the climbs and foot hops the descents. Today she once again excelled and took her 4th consecutive stage win and extended her lead beyond all reach. Kerry Sutton and Yangdi Lama Sherpa repeated the 2nd and 3rd places from the previous 3-stages; however, Kerry today twisted her ankle badly. Fingers crossed it will not impact on her performance over the coming two final days. Tomorrow, stage-5 is a short day of just 16km’s and 2124m of vertical gain. 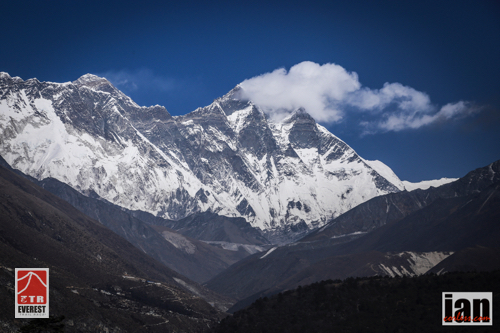 It culminates at the monastery at Tyangboche with Everest, Lhotse and Ama Dablam providing arguably the most impressive finish line of any race!